What every board member needs to know. It should no longer be a surprise that many nonprofit boards struggle to fulfill their fundraising responsibilities. Leading with Intent: 2017 National Index of Nonprofit Board Practices echoed previous years’ studies in reporting that board chairs and chief executives (CEOs/executive directors) ranked fundraising as the biggest challenge area facing boards. 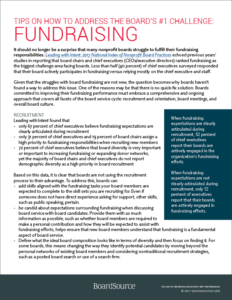 This resource offers fundraising tips when it comes to recruitment, orientation, personal giving, culture, and more.